I just thought of starting a little series called Love it or Hate it. There are always those certain things that gets strong reactions from people, either you adore-love-can't wait to have it, or you despise-hate-don't want to see it. To kick this off, let's talk wallpaper collage. The first time I've seen this look, I knew it's not for everybody. People who loves colorful, quirky things would probably love it..
and those who breathes simplicity and who can't live with clutter will hate it. ..it's in the right dosage, with great color and print combination. It takes some creative eye to pull this off, but it I think it does wonder if done right. How about you? Love it or Hate it? Hate it on the walls, but I saw a similar idea in a rug at HomeGoods and I loved it! It was similar to your second picture. 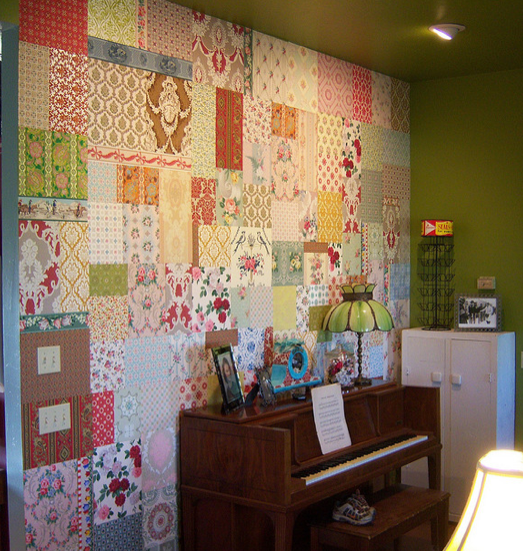 It would be too hectic for me on the walls, but a patchwork rug I could totally dig. Hubby liked it too but convinced me not to purchase it as he said I would get sick of it quickly. He is probably right. Wow, I'm in between on that one. I think it really depends on the paper that is used. I like the first one a lot but the other ones not so much. In general I think it's a pretty feminine look, so I don't think it would work in my house. Maybe if I had my own crafting room/office I would think about it. I'm very partial to collages though. The right wallpaper combo would be really cute. I think that it would get old pretty quick and taking down wallpaper is the worst! I probably would not do it but I do like it. hate. just looks way too busy. i think patterns are better incorporated in pillows, etc. I do not like it at all. I liked the idea of someone's comment of it being in a rug. I think it is way to busy. 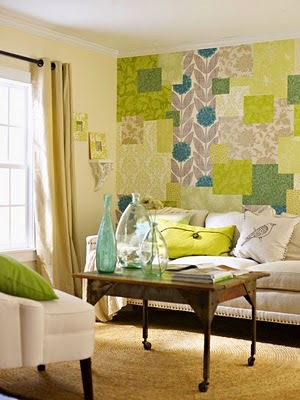 If you did a wall like that you would have to stick to solid colors for the decor. Absolutely, totally freaks me out! 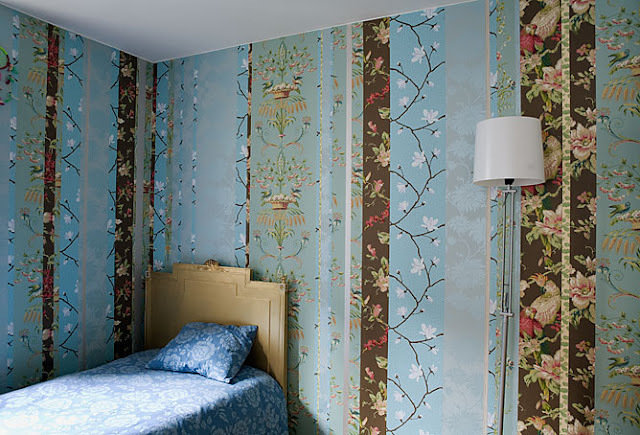 I prefer the striped wallpaper, but I probably wouldn't do it in my house unless it was in more muted tones. I don't want to say I hate it, because it looks really great in the photos, but it's definitely not my favourite look. Hate all of them except for the blue and green one which is actually ok. But I'm one of those people who likes simple things like you mentioned and this would just drive me crazy in my house! 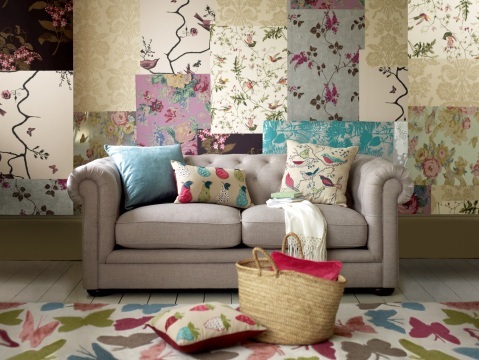 I love the mixture of the patterns, but I think I would like it more on a smaller scale. Maybe if it were broken up on several canvases and hung on the wall that way. Even if it were on a smaller wall as an accent. It sure makes for great pictures though. The chartreuse and gray wall I like, but I'm more of a simple-is-better kind of person. That also makes some aspects of my house boring, so I can see the draw for those who like more pizazz. Maybe in a playroom? For me, most of the time, its way to busy. 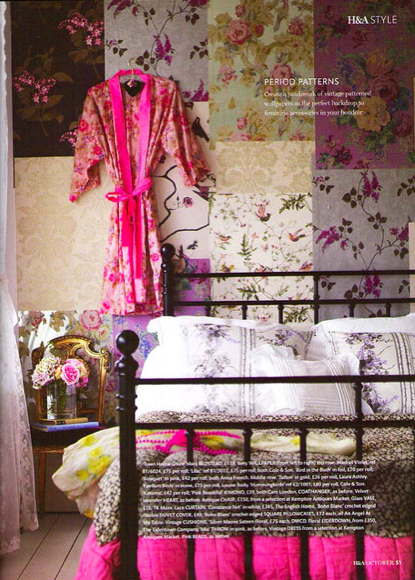 However, I really liked the rooms it was done in for the Country Living magazine and Selinia Lake. I think if done right, it can work, ,but the decor needs to be done very carefully around it so you don't explode with business! i love it! but for me it has to take up just one wall coz it might be too much. :) it's a cool and fresh idea! I absolutely LOVE it...my husband not so much! Maybe I can seek it into one of the other rooms before he realizes it and when it is done...too late! LOL! I'm colorful and quirky myself, so this speaks to me. I always have color, a collage, or anything on the walls but plain white. It makes me feel at home. I actually can't be productive in a plain space. 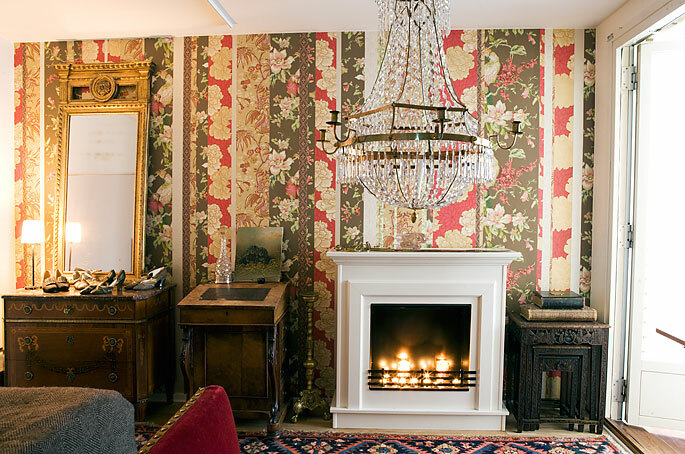 A home can have a "cluttered" wall design but still be clear, functional, and even minimalist. Love it! specially with flower patterns. Okay I've spoken too soon! :D Thanks for dropping by! I only liked it in the Country Living shot. So I guess it's not for me. I would do this on one wall only, not an entire room unless it was really mild looking. I love looking at it but I think I'll be sick seeing it in over a couple of weeks..